ASHGI President and founding board member, C.A. Sharp, can conduct one- or two-day seminars for your club or group. The Breeder’s Challenge provides an overview of genetic health issues in he breed, discussing what they are, their impact on the dog, and how breeders can reduce their risk for producing affected dogs. The Decision Tree presents a method through which breeders can keep their focus on producing those traits they want to preserve or develop in their dogs while taking effective steps to breed away from those they do not. 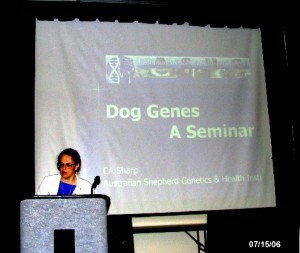 Dog Genes: A Seminar covers all aspects of canine genetics. This is available in Australian Shepherd and all/other breed versions. The Breeder’s Challenge (half-day version) This abbreviated version of the full day program described above, focusing on the most critical breed health issues. 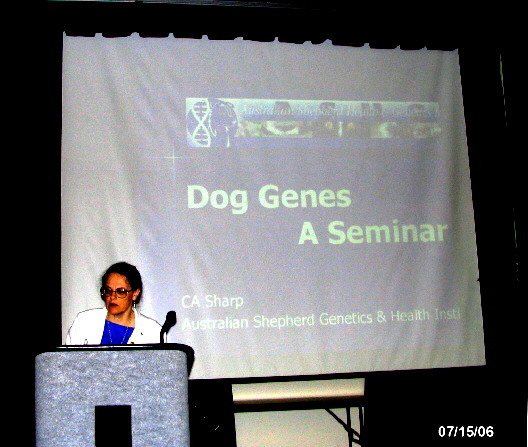 The Backyard Geneticist gives an overview of current genetic science as applied to dogs and explains how you can make use of the information science provides in your breeding program. Chats – Informal question/answer and discussion sessions 10-50 people. These sessions generally last from one to three hours but can be full day events, too. Chats are recommended to follow one or more formal programs rather than stand-alone events. IDASH Demo (wifi access required) A tour of ASHGI’s International Directory for Australian Shepherd Health, demonstrating operation and features f the Open Health Database, Pedigree Service, and Pedigree Analysis Service. Pedigree Analysis Made (sorta) Easy shows breeders how to effectively use pedigree data to make mating selections that help maintain and improve good traits while avoiding the bad ones. Putting DNA Tests To Work For You! does just that. This program covers the tests currently available for Aussies, what the results mean, and how to make the best use of them. 10 Steps To a Healthier Breed reviews ten proactive things dog owners and breeders can do to benefit the overall health of their breed. Don’t see a program that fits your needs? Many of the above were developed to meet the request of a host group. Tell us what you want and we’ll see if we can create a program for you! Would you like to book a seminar? Please identify two or three potential dates for your event. This will save time getting your event booked should your first choice date be unavailable. Presentations will not be booked within the periods starting two weeks before through two weeks after the ASCA and USASA national specialties. For events that will require air travel for the speaker, there is a winter travel blackout from mid-November through mid-March to prevent last-minute cancellation of events due to weather. For the formal presentations, the room should be large enough for everyone attending to sit, preferably with some sort of writing surface (desks, tables) on which they can take notes. The room must be able to be darkened sufficiently for people to see the PowerPoint via projection or television. Classrooms, conference rooms and community rooms at schools, libraries or commercial centers are ideal. We will not book formal presentations in private homes. However, Chats can be held in any comfortable, relatively quiet indoor setting. Your club will be responsible for providing either a PC-compatible projector or a large enough television with the necessary input port plus a laptop loaded with PowerPoint that you KNOW works with the projector or TV. The speaker will bring a laptop, but not every projector is compatible with every computer and we have no way to determine whether our machine will work with your projector/TV prior to arrival. Handouts – we will provide a master copy of related hand-outs. These will need to be copied by your group prior to the seminar and brought to the seminar in sufficient quantities that everyone can have a set in hand at the start of the first session. Local facilities, projection equipment and other necessary equipment and supplies are the host organization’s responsibility. You should be able to recoup your costs for these through the fees you set for attendees. Reimbursement for round-trip transportation from Santa Maria, California. Lodging and meals for peaker while at your location (actual cost reimbursement basis). Booking fee – $100 for Australian Shepherd clubs, $200 for others, payable at time of booking. Promoting the event will be the responsibility of the host organization. You know your local dog community and how to reach them better than we do. We would appreciate receiving a copy of any promotional material you send out. We recommend that you advertise a start time half an hour before the actual scheduled start of the program. That will allow time to get everyone checked in and prevent latecomers from interrupting the talk. If at all possible, include lunch with the program. If people must leave the site to get lunch, the break tends to stretch at least a half hour past schedule or people wind up missing part of the afternoon session because they return late. Dog Genes morning session is approximately 2 – 2½ hours long; the afternoon session is approximately 2-3 hours. Other presentations vary considerably in length, so please inquire. When your group books a seminar, you will be sent a booking contract specifying dates and types of presentations to be made, payments and responsibilities of the club and ASHGI. ASHGI will prepare the official contract and send it to you when your club indicates you want to book a presentation. Do you wish to view a Sample Booking Contract? Would you like to book a seminar?